I am so forgetful sometimes … let me tell you what I did this morning. I wash and dry my jeans wrong side out … I heard that it helps with fading. I usually turn them right side out when I put the laundry away … but I didn’t this past time … no big deal … right? This morning when I got dressed, I put my jeans on … two legs in … pulled up … and I tried to button and zip, which didn’t work … then I looked down … I forgot to turn them right side out! I could be loosing it … if I ever had it! 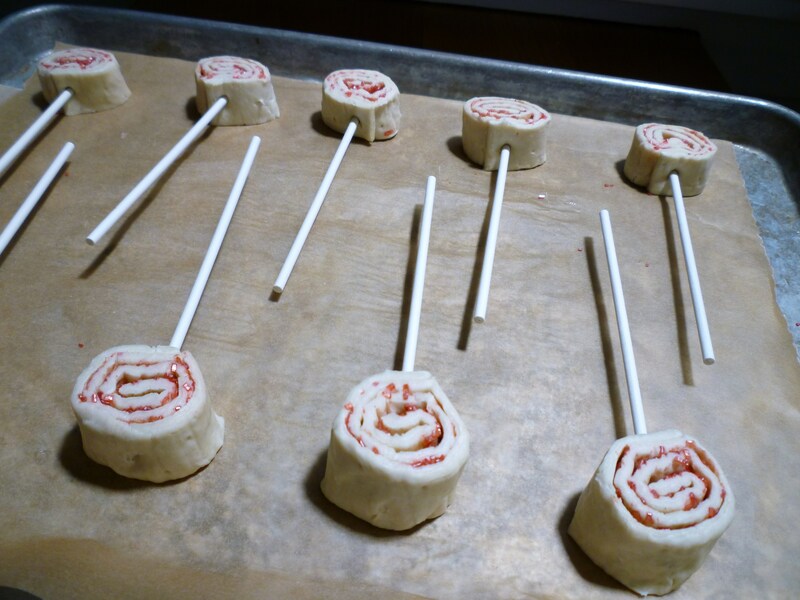 Anyway … the point of my story is … while checking out other blogs this morning … I remembered that I wanted to make these Puff Pastry Rose Pops … I almost forgot! Check out Nifty Thrifty Things … it is because of her that I remembered! 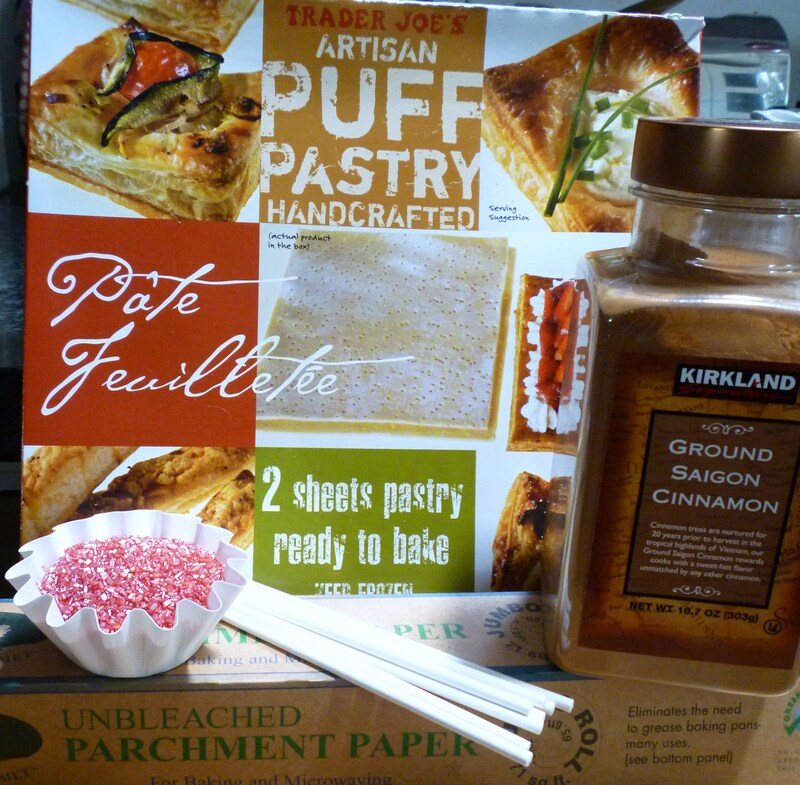 Puff pastry is my friend … a truly wonderful invention … that is so conveniently available in the freezer section at the grocery store! Just let it thaw and use it for making appetizers, main dishes, desserts or … rose pops … just in time for Mother’s Day, Teacher Appreciation Day or just to say Thank You. Easy peasy … now how about making some with different colors of sugar? 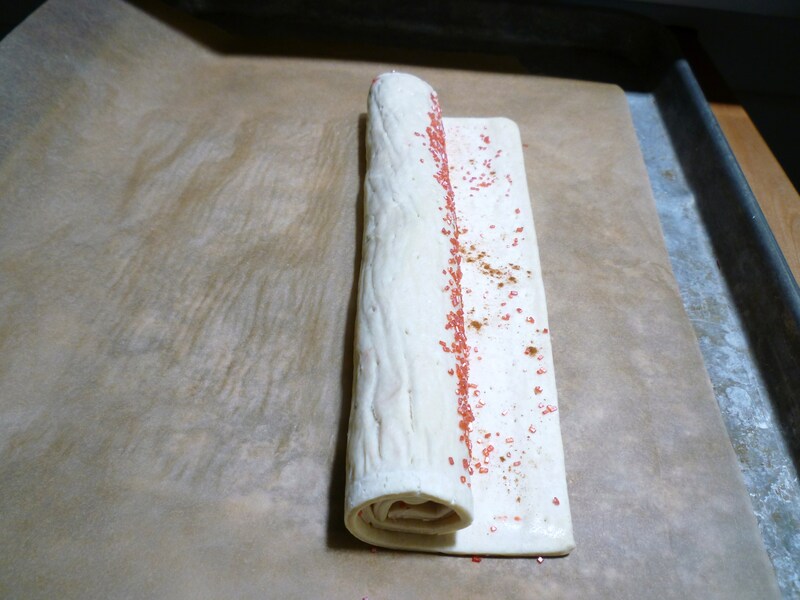 Place sheets of puff pastry on parchment lined baking sheets. 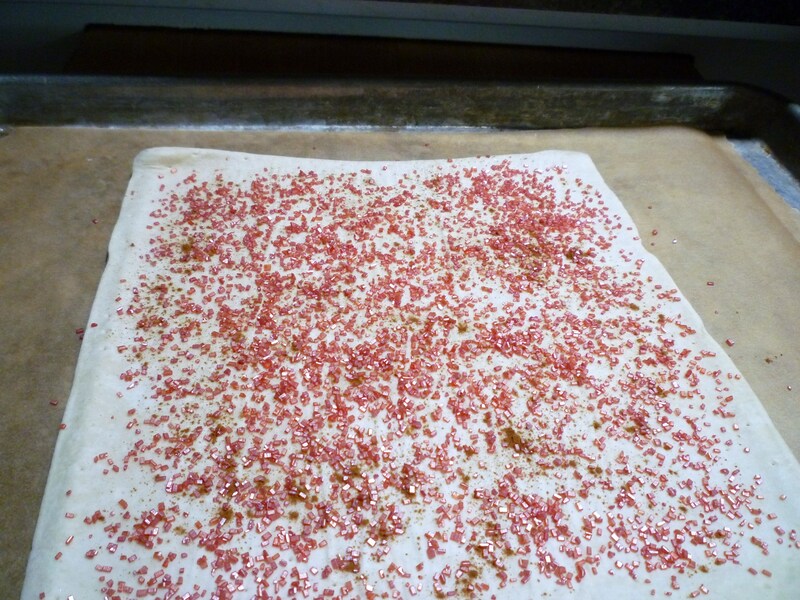 Sprinkle the pastry with cinnamon and colored sugar. 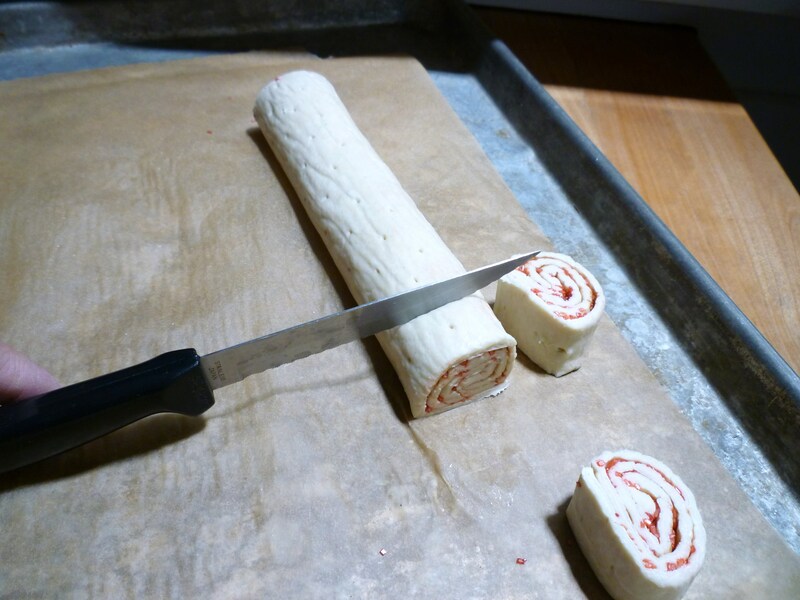 Roll it up into a log. Insert a lollipop stick into each slice … but do not let it come out the top! Bake on parchment lined baking sheet for about 15 minutes or until golden brown. Cool completely and tie paper leaves on sticks if desired. I am looking forward to your comments ! these look so good and so darn easy to make. 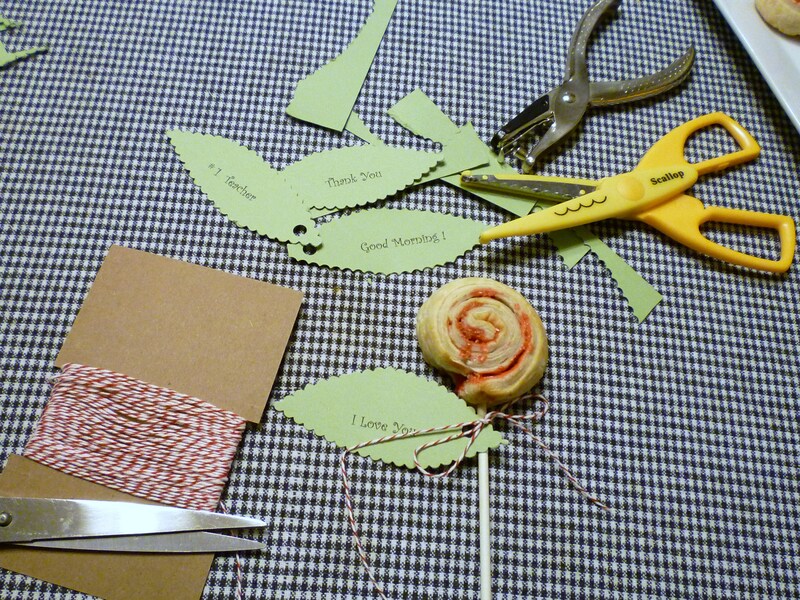 I use dental floss when cutting things like this. Less chance of squishing down the dough when using a knife. Using dental floss it makes a nice clean cut. I hope you find it to be a simple project! Thank you 😉 I did look at my clothes before I put them on today. It’s tasty stuff though, I’ll have to give these a shot! Look, some of us have no idea how much sugar or cinnamon to use. Maybe a teaspoon of cinnamon? These look adorable and I would like to make them but I don’t want anyone to spit them out because I used 2 or 3 times too much or too little sugar and cinnamon. Help those of us out who aren’t such great cooks. Thanks! These are the cutest! I can’t wait to try and make them. Thank You! 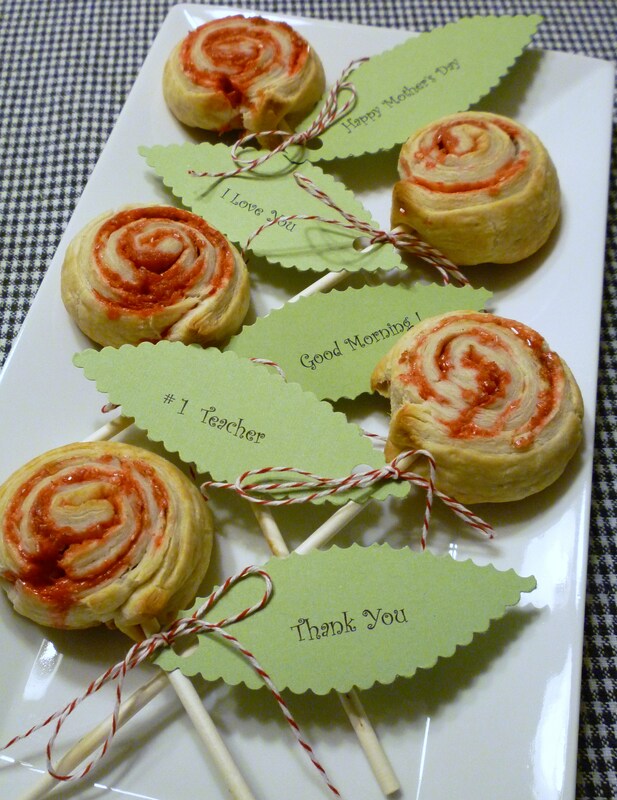 Love the flowers you created out of the puff pastry pinwheels. Great idea that could be used for so many occasions. very cute…I will soon try this! Thanks for sharing your idea! What a great Idea for suckers at a luncheon. Thanks so much for this idea. 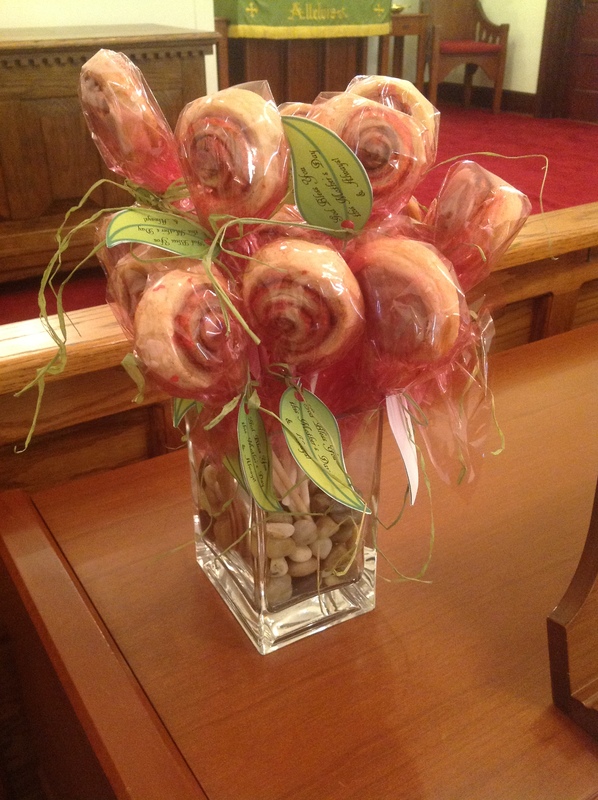 I made them for all the ladies at church for Mother’s Day. Everyone loved them! I wrapped them individually in pink cellophane, tied on a Happy Mother’s Day leaf, and put them all in a vase until time to hand them out. Not sure how to post a picture. Always look forward to opening your blog. Great idea, they are adorable! Any idea how much in advance they can be made and remain fresh if individually wrapped? Thanks! Nancy, I made mine on Saturday and on Tuesday we ate the last one. It tasted just fine and was still soft. Because I like cinnamon buns sweet, I spread some powered sugar icing on the back side. Sweetsimplestuff, I just emailed a picture of my roses to you. Sorry for the delay. Thank you for that info … it is good to know that they will last 😉 Got the photo! I am so making these this weekend for a girlfriend party. Thankyou, you solved the what to make for party favors.